Maria DIATCHENKO - MEĐUNARODNO VIOLINISTIČKO NATJECANJE "Vaclav Huml"
Masha Diatchenko was born in Rome in 1994. Born into a family of violin players, Masha began studying violin and piano at the age of four years, under the guidance of her father, M° Serguej Diatchenko. At the age of five she scored her first success, performing as a pianist in a recital by M° Ennio Morricone at the Aula Magna of the University “La Sapienza” in Rome. 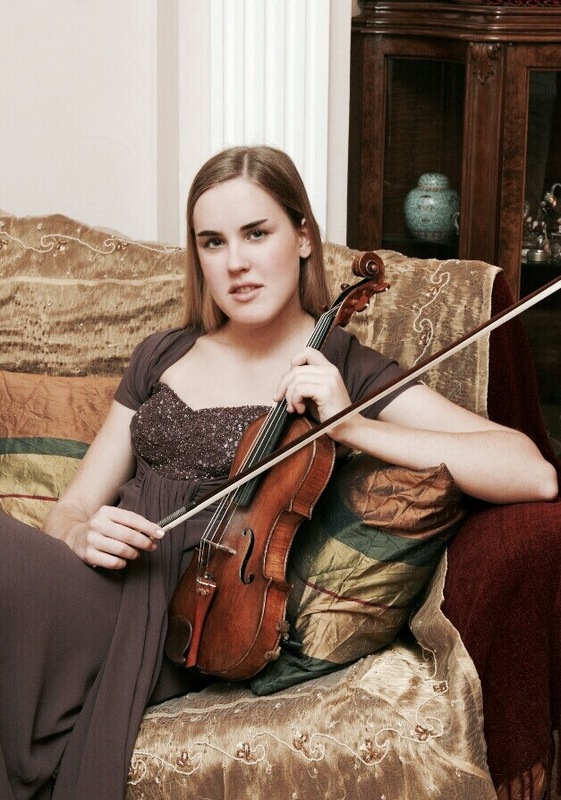 Since then, she began her career as a musician, gradually orienting herself towards the violin, for which she has shown a natural talent and innate abilities. At the age of six, Masha was invited to perform at the prestigious festival for young violinists organized by M°Uto Ughi “Uto Ughi for Rome”, where she performed the Concerto in A minor by J. S. Bach attended by M° Ughi himself, scoring a huge success and acclaimed by the Maestro and the audience. She also took part in cultural and social events where she performed as violin solo and with an orchestra in the presence of Pope John Paul II, Pope Benedict XVI, Cardinal Bertone, Princess Caroline of Monaco and prominent figures in culture and politics. In 2007, at the age of 12, she graduated at the Conservatory of Genoa with best grade and honors with M° Massimo Coco. Her talent is recognized in numerous national and international competitions where she won the first prize and special merit mention at the Strings National Review of Vittorio Veneto city. As particular artistic recognitions she received the “St. Gines Crusader Award” by the Confederation of the Crusader Knights in 2004, the “Uniglobus” award in 2005, the “Cisterna d’Argento” award in 2005 and 2007, the “G. Pressenda Award” in 2007 , the “Arca d’Oro International Award” in 2013, the “Foyer des Artistes International Award” in 2010, in 2014 and in 2015. In November 2004 she was declared the youngest professor at the University for Peace in Assisi and in 2007 she became an Academic at the Gentium PRO PEACE Academy. Her music repertory ranges from the most important concertos to contemporary music: in fact, Maestro Franco Mannino entrusted Masha with the performance of his concerto No. 2 for violin and orchestra. So far she has recorded six CDs with the concerto by N. Paganini No. 1, concertos by N. Paganini No. 2 and by J. Sibelius, the concerto by J. Brahms and “Introduction and Rondo Capriccioso” by C. Saint -Saëns, concertos by P. Tchaikovsky and N. Paganini No.3 with “Carmen Fantasie” by F. Waxman, the concerto No.1 by S. Prokofiev and “Carmen Fantasie” of P. de Sarasate, and the concerto by I.Stravinskij. Masha is the first 12 year old violinist in the world who has performed Paganini’s 24 caprices in a single live concert. She has attended several master classes (Zahar Bron in Vienna, Lewis Kaplan in Salzburg, Lewis Faberman in New York, Boris Belkin in Chigiana Academy in Siena, Satu Jalas in Rome), she held several hearings with important personalities from the world of classical music like M°M. Rostropovich, M° Z. Mehta, M° U. Ughi, she has taken part at several international festivals including “Les Sommets du Classique” Festival in Crans-Montana (Switzerland), “Uto Ughi per Roma” in Rome, “I talenti del III Millennio” in Lviv (Ucraine), “Accademia dei Cameristi di Bari” (Italy, Austria, France) and she has carried out her intense concert activities in the best music halls in Italy and in foreign countries. In 2012 she mades a tounèe in Perù in which between the various destinations she was invited to partecipate to the “International Festival of Violin” in Lima, where she has been a huge success among the audience and the press. She also released interviews to the Ukrainian television, to EuroNews, to Euroclassical and to Italian TV channels RAI 2, RAI 3 and RAI Sat. In 2015, she graduated at the Academy of ‘’Santa Cecilia” in Rome with best grade and honors with M° Sonig Tchakerian. From 2014 she studies with M° Boris Belkin at the Musikhochschule of Maastricht (Nederland), and in the Academy Chigiana of Siena (Italy).